One very simple way to save money is to skip shopping for a week or two and use what you already have on hand. We call this Eating From the Pantry at our house and it’s something we try to do at least once a quarter. Set a goal not only for how long you’re going to try to go without stepping foot into a store, but also set a goal for what you’re going to do with the money saved. Maybe you’ll put it toward paying off some debt, or use it to pay cash for an item you’ve been saving for, or even put it toward your Vacation Savings fund. You could also consider donating the money to charity — which can give a lot of extra purpose to this challenge! Look through your cupboard, refrigerator, and freezer to see what you already have on hand. Dig really deep and make sure you’re pulling out all the possibilities. Once you’ve inventoried what you have on hand, use the ingredient search feature on AllRecipes.com to get some recipe ideas for using up what you have in your pantry. I love that you can type in what you have on hand and what you don’t have on hand and it will generate a list of recipe ideas for you! Once you’ve set a goal and inventoried your supplies, it’s time to dive right in and start using up what you have on hand and staying away from the grocery store. 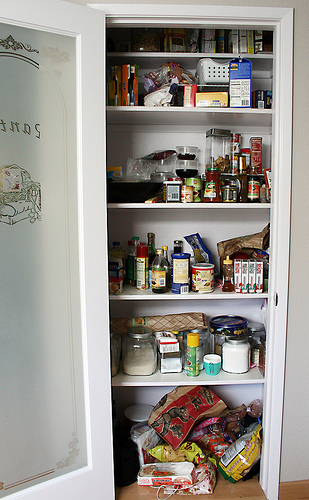 At the end of November, I embarked on my own challenge to clean out my pantry and freezer. I am proof it can be done even if you’re not a master baker or planner. If this pantry month seems too difficult let’s start with a new perspective. Remember the days when an empty plastic container and cardboard from the paper towels could entertain you for hours? Or times in college when you made pasta in the coffee pot and grilled cheese sandwiches with an iron? It’s time to get creative again! Whether it’s breakfast for dinner to finish up some pancake mix, , or, cooking is about enjoying the process and breaking out of the mundane. Creativity comes when you have seventeen cans of tuna and need a new recipe. Creativity is testing new sauces on pasta and trying new recipes, ingredients, and styles of cooking. As we settle into our routines, grocery shopping can become a tedious chore. Take this month to focus not on what you don’t have in the pantry but what you do. Instead of focusing on the deals you might miss, enjoy the ones you found already! It’s simple to grab chili on sale and celebrate a great deal but it’s a little harder to make chili and cornbread or chili on a baked potato three times a week to use it up. Look at all the opportunities we have to buy food and utilize discounts, coupons, and rewards. It’s easy to take that for granted. When was the last time your family gave thanks for having a local grocery store, fresh produce, and the funds to pick up a treat or two? 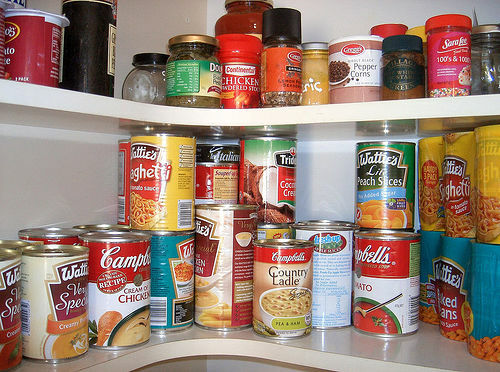 Once you embark on the Eat From the Pantry “Adventure”, try a little trick I call ‘spelunking.’ Simply dig through your stock and find something you can use in place of going to the store. Crunchy salad toppers can be used in soup. Top macaroni and cheese with the last tablespoons of bread crumbs. Turn mushy apples into applesauce and juice into popsicles. Try . Or, if you get stuck without an “essential” ingredient on substitutions is one of the easiest to reference. I know my great grandmothers would be ashamed to see the amount of food I let spoil each week. They didn’t waste; the mantra was to “use it up!” In that spirit during my Pantry Month I rescued a ham from the work potluck that was to be thrown away. Ham omelets, sandwiches, added to beans and soup helped stretch many meals. If you’re thinking your stock can’t possibly last 31 days give it a shot and find out how long it WILL last. The worst that can happen is you’ll find your answer. Have you ever tried an eating from the pantry challenge? If so, how long have you gone without going to the store? We are doing a no-spend month this month to help with paying off our law school debt. This includes eating exclusively from the garden and pantry. We already cook most things from scratch and have a good food storage of basic ingredients, so we have it easy I guess. Getting our whole family involved really helps everyone stay positive. We are all committed and up for the challenge. Instead of being drudgery, it’s more of a game, like you said. When we are out of a staple or a favorite food, instead of getting upset (like the kids might in a normal month), they say “I guess we’ll have to wait until next month!” And suddenly everything is fine because it’s part of the challenge. Interesting idea, but what do you do when your husband and 3 kids consume 6 gallons of milk in a week? And your freezer is full of a 1/4 beef so you can’t freeze gallons of milk? Also what about bread and fresh produce? Could you start by trying to go for 2-3 extra days without going to the store? See how that goes and then try lengthening it if you think you’re up for it. Milk is our downfall….big time. I have plenty of produce that I have frozen as well as bread. However, if it’s something you go through a lot, when I try a pantry challenge, I usually write the things down that I will HAVE to go to the store for. Usually it’s milk, eggs, things like that. Then I have that list with me. Those are the ONLY things I can go to the store to get. I make it easier by sending my husband who doesn’t like to grocery shop. He just grabs and comes home. If you can’t do this challenge because your family drinks enough milk that you don’t have room to store it, modify the rules of the challenge. Only go to the store to buy milk and shop from your pantry for everything else. I’ve already done it where I limit my shopping trips to milk and fresh produce and that’s it. Even that can help cut down on expenses for a while. I like to have powdered milk on hand, while we mostly use regular milk, it’s nice to have it as a back up if we run out. Our goal this year was to do three seperate no spend two week periods. We are starting our second one later this month. I enjoy emptying our pantry. We still grocery shop, just truly the necessities. Bananas and milk. We just did this last week. My daughter’s gymnastics class was cancelled for spring break and that is usually the same day I head out to get groceries (saves gas). So since I didn’t need to head out, I told the family I wasn’t going to go grocery shopping until next gymnastics class. We had a few interesting meals but everyone survived and now I have a great pool of grocery money to use to stock up on food I see at rock bottom prices. That is such a great idea. It’s true, eating from what you already have can help you save so much money. We usually try to eat from the pantry before hitting the store. Since we have a deep freezer stocked with meat, veggies and fruits, we could technically not grocery shop for months. So when people need to save, it sure is handy. Yes, yes and yes! I usually think of what’s in my cupboards and freezer before making my menu/grocery list. But I’ve found I forget a lot of things doing it that way. So just last night I went around writing down the things I had in categories (protien, grains, etc…). Then planned my meals and it looks like I only need to buy a very small amount of things to complete those meals. This seems sooooo unhealthy. We usually get a Bountiful Basket (a mix of about 12 fruits and veggies) each week and then 1-2 more produce items each week at the store. We eat all of it. It doesn’t get tossed. I can’t imagine going a whole month without getting more fresh produce. We eat some frozen but you are very limited with frozen. If it doesn’t work for you family to use up what’s in your fridge and freezer when it comes to fruits/vegetables for an extra few days or week or two (or you use it up every week — we usually buy extras so often have lots of produce that will keep for a few weeks), maybe try only shopping for fresh produce one or two weeks and making everything else from what you already have on hand? As always, do what works for your family! We are doing a week long one because we are in the second week of spring break. I spent the budget for food at the beginning because of out of town guests and other things. My 16 yr old daughter opened the fridge yesterday and gave me a look. I think we have 2 dozen eggs some carrots and 1/4 a gallon of milk til friday. Then I took her to the pantry and we “shopped” to see what we could make for the next two days. She was shocked because after 15 mins we found we had enough to eat for another week. That was having some type of meat with dinner every night. Of course in the freezer we have over half a deer left from last season so yummy. When you do this how do you stay in budget the next time you do go shopping? When we tried it we went through all our staples so we had to replace those items (flour, sugar, butter, bread, pasta, meat, ect) the next time we shopped and went over budget. I dont feel like we saved anything, just delayed the spending. Essentially you are “delaying” the spending but your saving money by not wasting anything in the pantry or freezer by letting it go bad or buying extras of things you already had but didn’t inventory. You can stay in budget next time by making a menu and using low cost recipes. You can also try making recipes that “recycle” ingredients, using them in the next nights dinner. I stick to by budget by putting my menu on the fridge and keeping that weeks recipes in a folder that i also keep in the kitchen. Sometimes I plan my menu around sales and coupons if i get a good deal. 1) Forces you to use something you wouldn’t use otherwise. 2) Give you a pot of money you can reserve for stocking up on extra good deals. OTOH, sometimes when money is short, deferring spending is, itself, what’s called for. My husband and I will do this every few months to “purge” our freezer and pantry of older items. We have some frozen produce in the freezer – maybe some chicken if there was a good sale. In the pantry we don’t keep very much – usually rice, dried beans, canned beans, coconut milk, pasta, coffee/tea, and baking items like spices, sugar, flour, etc. We’ll try to use up the beans and rice by making a lot of soups and chili for that week. In the next month we add a few items here and there to our weekly trips until we replenish what we used up. This keeps us from having the same items in our pantry for 1 year or longer! When I do a from the pantry challenge, I find that Google is my best friend. Usually I have an idea for how to use an ingredient and the challenge is i am missing an item or two from my usual recipe. (Search: “recipe for ______ without missing ingredient” or “substitute for ___ In _____”) Or if I don’t have an idea of how to use I search for ideas to use that ingredient. It gets addictive taking a few weeks off grocery shopping and its a bit of a bummer when you realize you truly need to go shopping again if you want to eat! My dh actually enjoys it when I am in this pantry mode. He says its actually really fun to try new things; we have found so many new favorites (completely new meals or variations of favorites) this way! We are “trying” this, I say trying because we will still buy lettuce, tomatoes and eggs weekly. We have everything else we could possibly need. One fast way : in a baking dish, cover the bottom with red pasta sauce, put a layer of chicken nuggets, top with more pasta sauce & top with shredded mozzarella cheese. Can repeat layers if you like. Heat till all is heated thoroughly. This can be served with pasta, potatoes, rice, etc. Another way: in a baking dish, cover bottom with an Alfredo sauce, place chicken nuggets, top with 1-2 cans (well drained) green beans or green peas, top with sliced mushrooms (optional), cover with more Alfredo sauce. Heat till heated thoroughly. Can be served with anything.